Japanese and Chinese fencers in action during the foil team finals of the Asian Games at the Jakarta Convention Centre. A fencer lunges in the Studio. A Chinese fencer in action during the foil team finals of the Asian Games at the Jakarta Convention Centre. A Singaporean fencer during her women's foil event of the Asian Games at the Gelora Bung Karno Sports Complex. An Iranian athlete during his foil event of the Asian Games at the Gelora Bung Karno Sports Complex. An Australian goal keeper looks on as the ball passes her during the TPG international tri series hockey match at the Sengkang Sports Complex. Cambodian players watch as a Thai player prepares to take a corner penalty during a World Hockey League match at the Sengkang Sports Complex. A Thai player shoots the ball past a Cambodian goal keeper during a World Hockey League match at the Sengkang Sports Complex. An Australian Goalkeeper looks on as the ball passes her during the TPG international tri series hockey match at the Sengkang Sports Complex. A Singaporean player rushes out of the goal as a Thai player takes a corner penalty during a World Hockey League match at the Sengkang Sports Complex. The Australian team in a half time discussion during the TPG international tri series hockey match at the Sengkang Sports Complex. A Singaporean player scores against Sri Lanka during a World Hockey League match at the Sengkang Sports Complex. A Singaporean hockey goal keeper prepares to catch the ball during the SEA Games at the Malaysian International Trade and Exhibition Centre. A Singaporean hockey player attempts to dribble past a Malaysian opponent during the SEA Games at the Malaysian International Trade and Exhibition Centre. The Singapore Women's Ice Hockey Club goal keeper stares at an approaching puck during the Lion City Cup at the Rink. Two players face off as the referee drops the puck during the Lion City Cup at the Rink. The Singapore Women's Ice Hockey Club having a briefing during the Lion City Cup at the Rink. A goal keeper stares at an approaching puck during the Lion City Cup at the Rink. A mask on the goal during the Lion City Cup at the Rink. A Filipino goal keeper stares at an approaching puck during the Lion City Cup at the Rink. 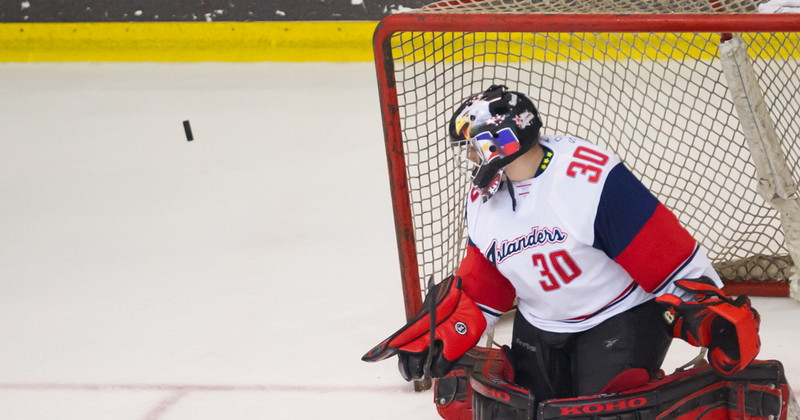 A goal keeper and player face off during the Lion City Cup at the Rink. 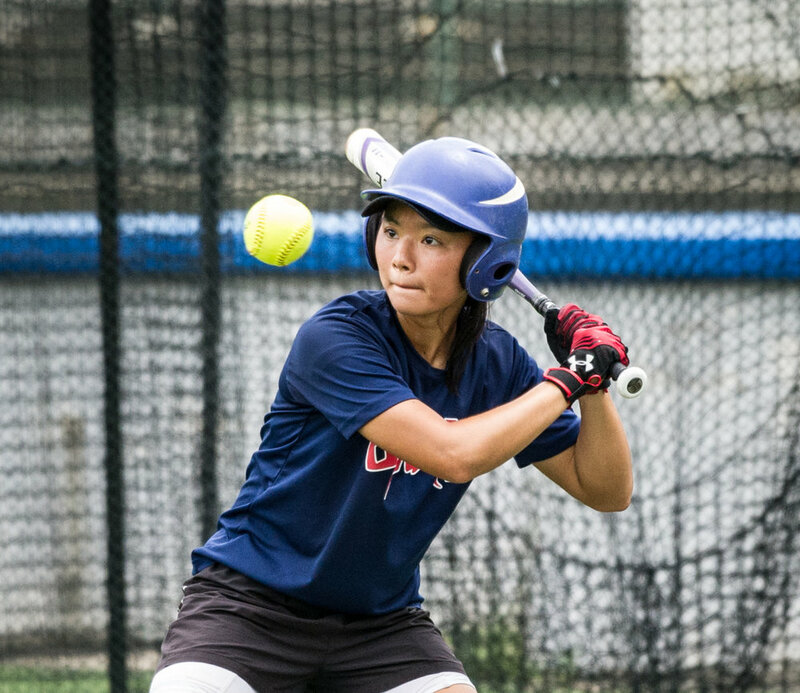 A Singaporean player prepares to hit the ball during the ORA Gryphon Cup slow pitch tournament at Raffles Institution. A Singaporean player prepares to catch the ball during the ORA Gryphon Cup slow pitch tournament at Raffles Institution. A Malaysian player watches the the ball during the ORA Gryphon Cup slow pitch tournament at Raffles Institution. A South African player charges past a pack of Japanese players during a Super Rugby match at the Singapore Sports Hub. Schoolboys during a schools rugby match at the old National Institute of Education field at Evans Road. A Singaporean player tackles a Malaysian player during the rugby competition of the ASEAN University Games at the Nanyang Technological University. A South African and Japanese player at a line out during a Super Rugby match at the Singapore Sports Hub. A Laotian player is tackled during the rugby competition of the ASEAN University Games at the Nanyang Technological University. Schoolboys in a line out during a schools rugby match at the Singapore Sports Hub. Two Singaporean players attempt to tackle a Malaysian player during the rugby competition of the ASEAN University Games at the Nanyang Technological University. A wake boarder jumps in training at the Singapore Wake Park. Three Singapore junior skaters talk to each other during the Tri-series SEA cup at the Rink. Two Singaporean speed skaters in action during the SEA Games at the Empire City Skating Rink. 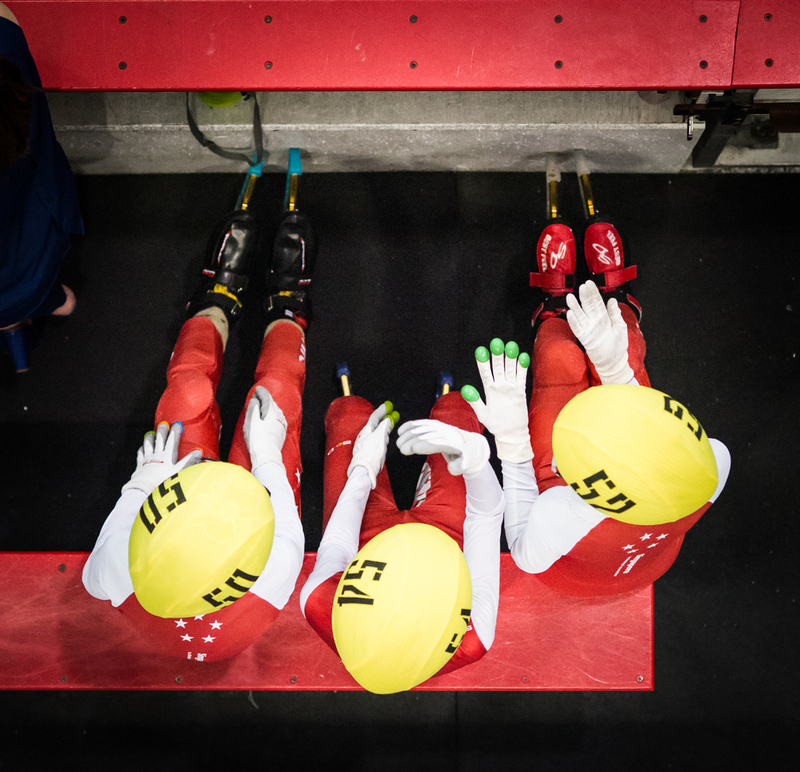 Singaporean, Thai and Indonesian speed skaters in action during the SEA Games at the Empire City Skating Rink. 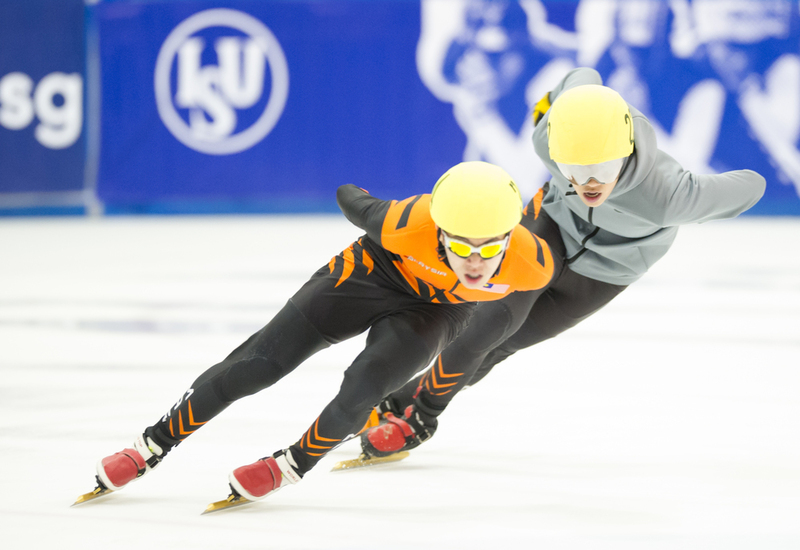 Two Malaysian speed skaters edge on the ice during the Tri-series SEA cup at the Rink. A figure skater executes a spin during the Singapore National Championships at the Rink. A Singaporean figure skater in action during the SEA Games at the Empire City Skating Rink. A Singaporean figure skater executes a spin during the Singapore National Championships at the Rink. A Singaporean player puts on his cap before the water polo competition of the ASEAN University Games at the OCBC Aquatic Centre. An Australian goal keeper attempts to block the ball during the Greece vs Australia pre-Olympic sparring match at the OCBC Aquatic Centre. A Japanese goal keeper blocks an attempt at goal during a friendly at the OCBC Aquatic Centre. A Greek player prepares to score against Australia during the Greece vs Australia pre-Olympic sparring match at the OCBC Aquatic Centre. A Singaporean player prepares to take a shot during a match at the Toa Payoh Swimming Complex. Swimmers put on their caps before the swimming competition of the ASEAN University Games at the OCBC Aquatic Centre. A swimmer in action during the IVP finals at the Singapore Sports School. A Thai swimmer in action during the swimming competition of the ASEAN University Games at the OCBC Aquatic Centre. A Singaporean swimmer in action during the swimming competition of the Singapore National Games at the Toa Payoh Swimming Complex. A Singaporean swimmer in action during the swimming competition of the ASEAN University Games at the OCBC Aquatic Centre. An Indonesian swimmer in action during the swimming competition of the ASEAN University Games at the OCBC Aquatic Centre. A Singaporean swimmer during the 400m Individual Medley Relay of the Asian Games at the GBK Aquatic Centre. A swimmer dives in during a relay at the IVP finals at the Singapore Sports School. A para-swimmer stares at the water during warm up at the ASEAN Para Games at the OCBC Aquatic Centre. A Singaporean swimmer puts on his googles during the SEA Games at the National Aquatic Centre, Bukit Jalil. A para-swimmer en route to a world record during the ASEAN Para Games at the OCBC Aquatic Centre. A synchronised swimmer is lifted into the air during the Schools Nationals at the Toa Payoh Swimming Complex. Chinese swimmers during their technical routine of the Asian Games at the GBK Aquatic Centre. A Macau Swimmer spins through the air during the free routine of the Asian Games at the GBK Aquatic Centre. Synchronised swimmers in action during the Singapore Open at the OCBC Aquatic Centre. A Singaporean diver prepares to enter the water during the Singapore National Diving Championships at the OCBC Aquatic Centre. A Singaporean Diver in action during the SEA Games at the National Aquatic Centre, Bukit Jalil. A Chinese diver spins during the 10m Platform Final of the Asian Games at the GBK Aquatic Centre. Korean divers during the 3m Synchronized Springboard Final of the Asian Games at the GBK Aquatic Centre. A diver prepares to take the plunge during the 10m diving finals of the SEA Games at the OCBC Aquatic Centre. A Malaysian diver jumps off the 10m platform during the SEA Games at the OCBC Aquatic Centre. A Singaporean diver rotates in the air during the Singapore National Diving Championships at the OCBC Aquatic Centre. Chinese divers during the 10m Synchronized Platform Final of the Asian Games at the GBK Aquatic Centre. A diver enters the water during the Singapore National Diving Championships at the OCBC Aquatic Centre. 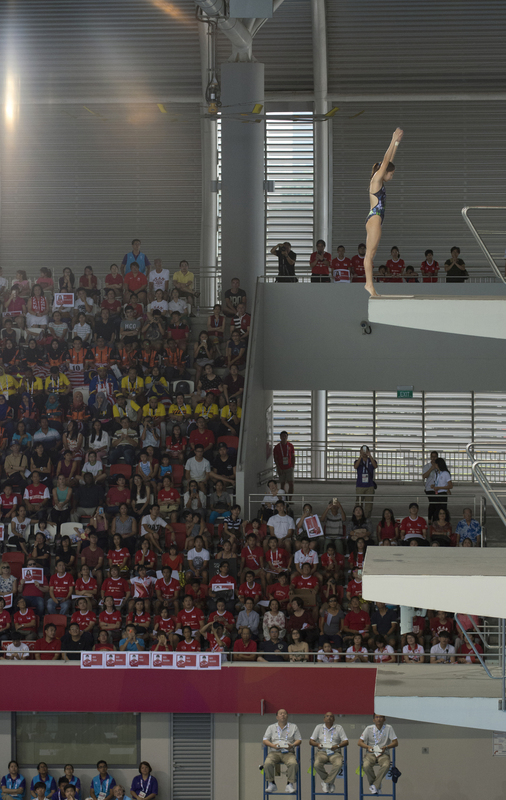 A diver rotates in the air during the Singapore National Diving Championships at the OCBC Aquatic Centre. A Malaysian Diver rotates in the air during the Singapore National Diving Championships at the OCBC Aquatic Centre. An Uzbek diver rotates in the air during the Singapore National Diving Championships at the OCBC Aquatic Centre. Singaporean paddlers paddling during the Dragon Battle Asia competition at the Orchid Country Club. British paddlers paddling during the Dragon Battle Asia competition at the Orchid Country Club. The competition logo on the arm of a racer during the Dragon Battle Asia competition at the Orchid Country Club. A paddle breaks during the Dragon Battle Asia competition at the Orchid Country Club. Canoeing medals hang on the bow of canoes during the SEA Games at the Marina Channel. A kayak slices through the algae bloom at the Marina Channel. Kayakers paddle in the golden hour at the Marina Channel. A Thai pair take an early lead in the Canoeing competition of the ASEAN University Games at the Marina Channel. Kayaks paddle through the algae bloom at the Marina Channel. A Singaporean paddler takes an early lead in the Canoeing competition of the ASEAN University Games at the Marina Channel. A Singaporean pair take an early lead in the Canoeing competition of the ASEAN University Games at the Marina Channel. A kayaker overtakes another during training at the Marina Channel. A canoeist paddles past a speed boat during training at the Marina Channel. 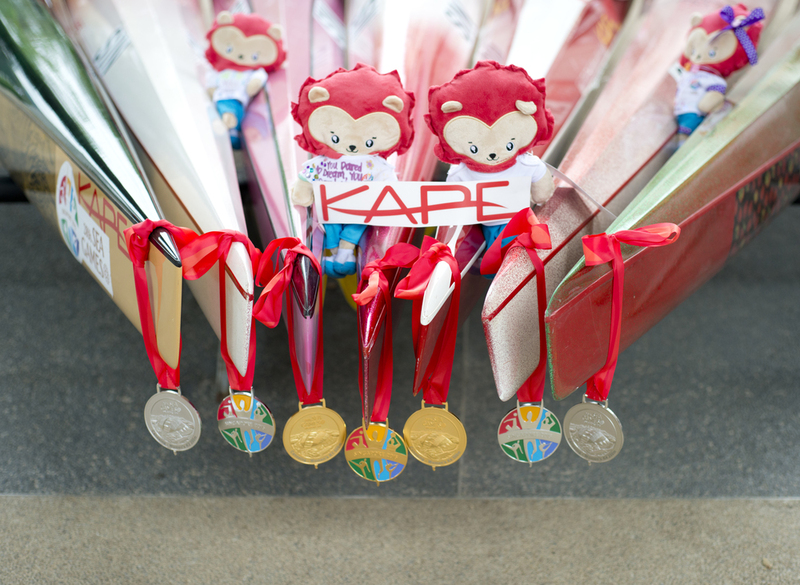 A kayaker poses with some of his SEA Games medals at the Marina Channel. Canoe polo players in action during the Canoe Polo National Championships at Orchid Country Club. Netballers watch as a ball approaches the net during a Netball Super League match at the Toa Payoh Sports Hall. A netballer prepares to score during a Netball Super League match at the Toa Payoh Sports Hall. Basketball players rush forward during a free throw at a National Schools match at the Jurong East Sports Complex. A Basketball player drives with the ball during a National Schools match at the Jurong East Sports Complex. A Malaysian Basketball player drives pass a Phillipines player during the Merlion Cup basketball competition at the OCBC Arena. A Phillipines player takes a shot in warm up during the Merlion Cup basketball competition at the OCBC Arena. Thai and Mongolian players watch the ball rebound during a match of the Asian Games at the Gelora Bung Karno Sports Complex. A Singapore Basketball player passes the ball during the Merlion Cup basketball competition at the OCBC Arena. A Basketball player from China prepares to lay up during the Merlion Cup basketball competition at the OCBC Arena. Basketball players watch as the ball makes the basket during a National Schools match at the Jurong East Sports Complex. A Thai para-badminton player serves during the ASEAN Para Games at the OCBC Arena. A wheel chair in the stroller zone during the ASEAN Para Games at the OCBC Arena. 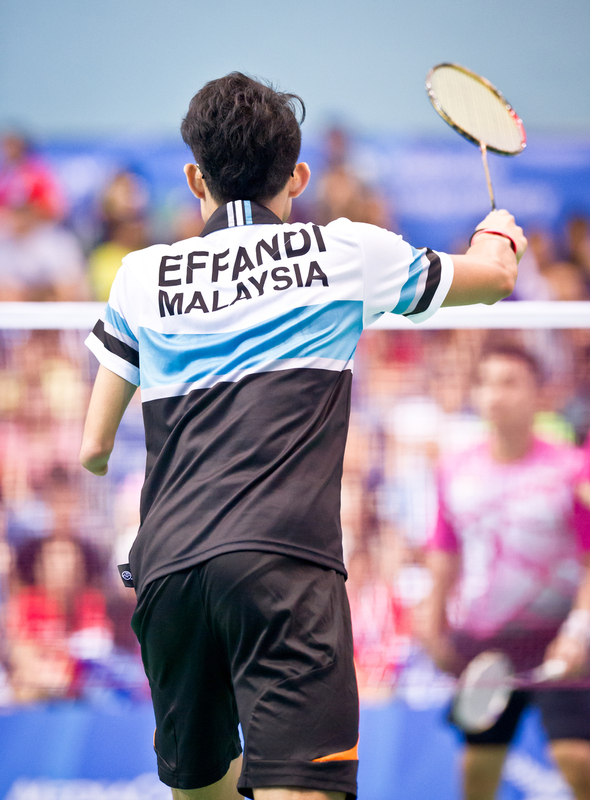 A Malaysian para-badminton player prepares to receive a serve during the ASEAN Para Games at the OCBC Arena. Players from Thailand and Indonesia rush for the shuttlecock during the badminton competition of the ASEAN University Games at the Singapore Institute of Management. A Singaporean badminton player celebrating during the SEA Games at the Singapore Indoor Stadium. A Singaporean squash player in action during the SEA Games at the National Squash Centre, Bukit Jalil. 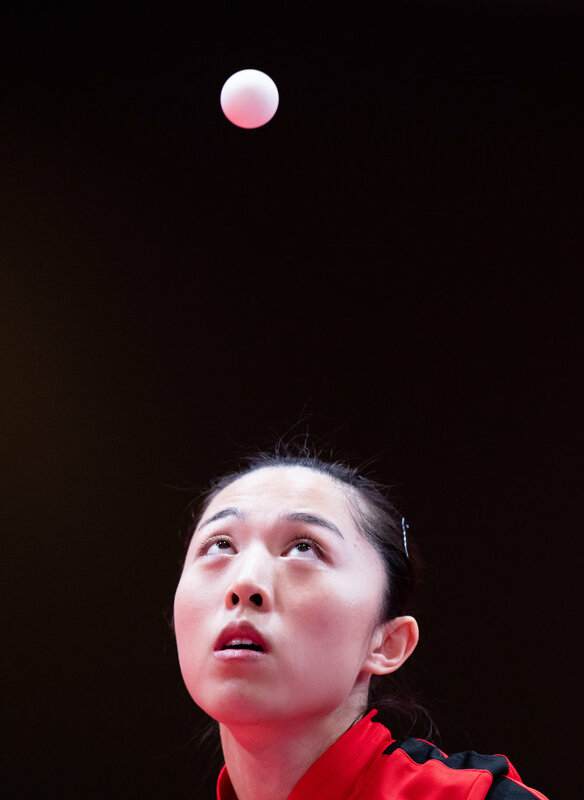 A Singaporean Table Tennis player watches the ball during the Asian Games at the Jakarta International Expo. A para-table tennis player serves during the ASEAN Para Games at the OCBC Arena. 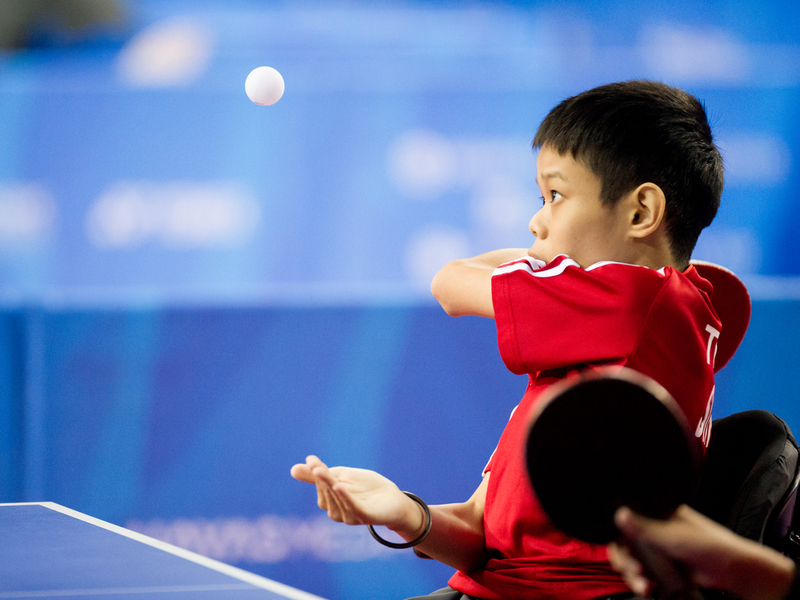 A para-table tennis player prepares to return the ball during the ASEAN Para Games at the OCBC Arena. Boccia players prepare to cheer during the ASEAN Para Games at the OCBC Arena. A Malaysian boccia player takes aim during the ASEAN Para Games at the OCBC Arena. 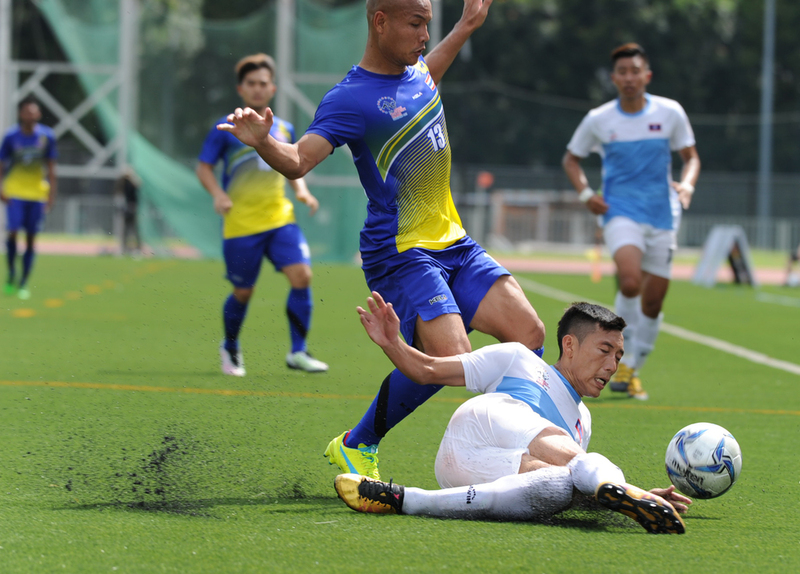 A Laotian player tackles a Thai player during the soccer competition of the ASEAN University Games at the Nanyang Technological University. The Laotian goal keeper kicks the ball during the soccer competition of the ASEAN University Games at the Nanyang Technological University. A Laotian player keeps the ball in play during the soccer competition of the ASEAN University Games at the Nanyang Technological University. A Burmese goal keeper watches as the ball enters goal during the SEA Games at the National Stadium. A Singaporean gymnast in action during the SEA Games at the Malaysian International Trade and Exhibition Centre. A Japanese gymnast during the Men's Artistic Gymnastics Qualifiers of the Asian Games at the Jakarta Convention Centre. A Vietnamese gymnast during the Men's Artistic Gymnastics Qualifiers of the Asian Games at the Jakarta Convention Centre. A Singaporean gymnast during the Men's Artistic Gymnastics Qualifiers of the Asian Games at the Jakarta Convention Centre. A Singaporean gymnast during the Women's Artistic Gymnastics Qualifiers of the Asian Games at the Jakarta Convention Centre. A gymnast does a vault during the National Schools Championships at the Bishan Sports Hall. A Chinese Gymnast during her Ribbons routine of the Asian Games at the Jakarta Convention Centre. A Malaysian Gymnast during her Clubs routine of the Asian Games at the Jakarta Convention Centre. A gymnast bounces her ball during the Singapore Open at the Bishan Sports Hall. North Korean gymnasts pose for a picture during the Singapore Open at the Bishan Sports Hall. A Chinese wushu exponent during her Women's Jianshu event of the Asian Games at the Jakarta International Expo. A Singaporean wushu exponent during the Men's Changquan event of the Asian Games at the Jakarta International Expo. An Indian wushu exponent during the Women's Taijiquan event of the Asian Games at the Jakarta International Expo. A Singaporean wushu exponent during the Women's Taijiquan event of the Asian Games at the Jakarta International Expo. A Japanese wushu exponent during the Women's Jianshu event of the Asian Games at the Jakarta International Expo. A Japanese cyclist during the Asian Games at the Jakarta Velodrome. A Chinese cyclist during the Asian Games at the Jakarta Velodrome. A Singaporean cyclist during the Asian Games at the Jakarta Velodrome. A triathlete edges during training at Seletar Air Base. A Singaporean hurdler looks through the hurdles during the 110m hurldes competition of the ASEAN University Games at the Chua Chu Kang Stadium. A Singaporean sprinter in action during the SEA Games at the Bukit Jalil Stadium. 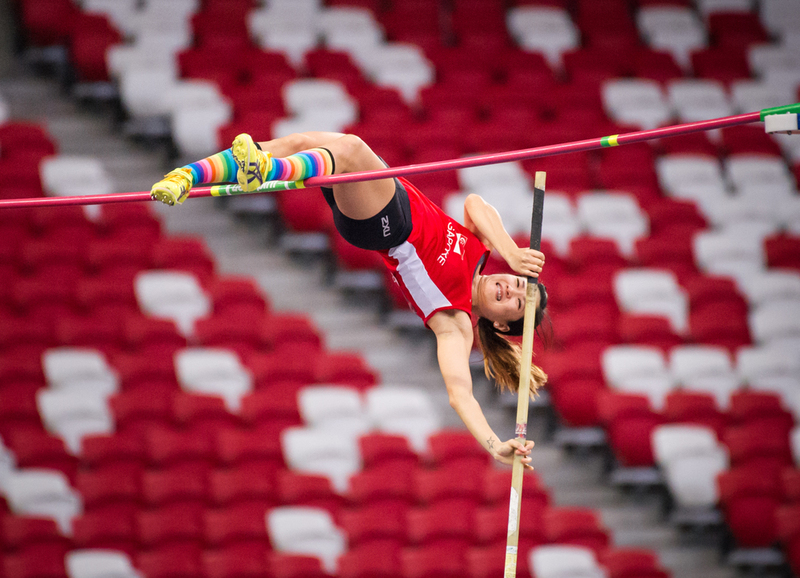 A Singaporean Pole Vaulter prepares to fly over the bar during the Singapore Open Track and Field Championships held at the Singapore Sports Hub. 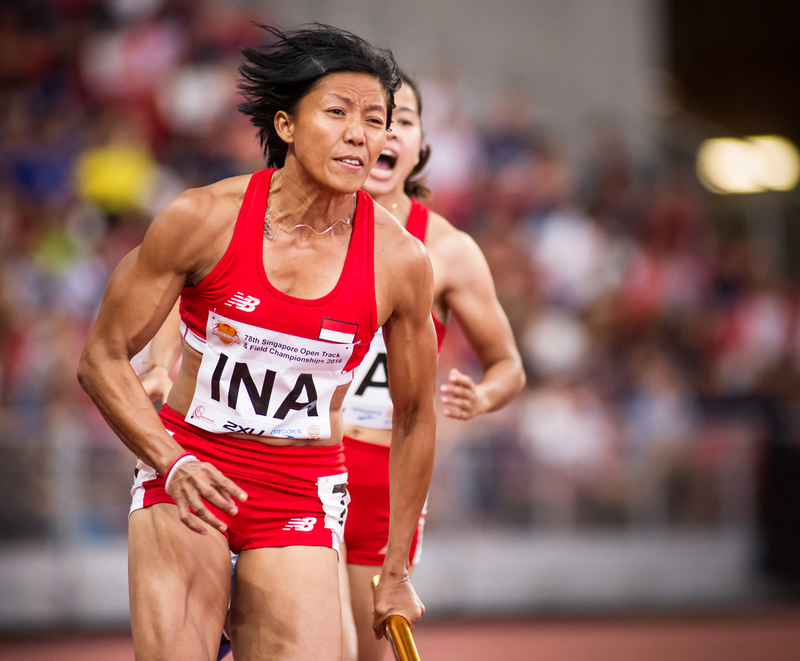 An Indonesian runner prepares to accelerate after receiving the baton in the 4 x 400 relay finals during the Singapore Open Track and Field Championships held at the Singapore Sports Hub. A Singaporean runner prepares to receive the baton during the Singapore Open Track and Field Championships held at the Singapore Sports Hub. A Malaysian Body Builder in the Gym. A Singaporean swimmer in the Gym. Fitness competitors in the Studio. A Singapoean Tennis Player in the Gym. Lai Wee Kiat and Clarice Yeo in the Gym. A Malaysian Fitness athlete in the Studio. A body builder flexes during the NABBA Muscle War competition at Scape. A Physique athlete in the Studio. A competitor from India flexes during the NABBA Grand Prix competition at Scape. A competitor from Malaysia celebrates during the NABBA Grand Prix competition at Scape. Winners of the fitness category pose with their medals during the NABBA Muscle War competition at Scape. A Vietnamese weightlifter during the men's 56kg event of the Asian Games at the Jakarta International Expo. An Uzbek boxer punches his Jordanian opponent during the Bantam Weight match of the Asian Games at the Jakarta International Expo. A Turkmenistan boxer punches his North Korean opponent during the Bantam Weight match of the Asian Games at the Jakarta International Expo. 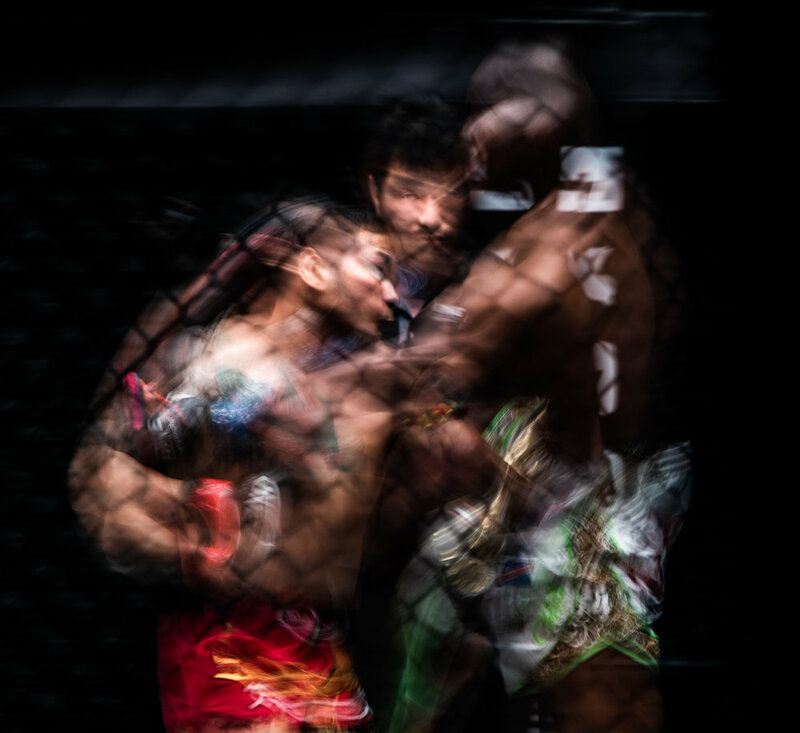 Thai and Congolese kickboxers exchange blows as the referee watches on during a One Championship World Title match at the Singapore Indoor Stadium. A Japanese MMA athlete punches her Singapore opponent during a One Championship World Title match at the Singapore Indoor Stadium. A Japanese and Singaporean opponent during a One Championship World Title match at the Singapore Indoor Stadium. An American kick boxer in the Studio. A Uzbek wrestler in action against his Kazakh opponent during his Greco Roman 87 kg match of the Asian Games at the Jakarta Convention Centre. Japanese and Kyrgyz wrestlers in action during the women's freestyle 68kg bronze medal match of the Asian Games at the Jakarta Convention Centre. Chinese and Mongolian wrestlers face off during the women's 68kg freestyle finals of the Asian Games at the Jakarta Convention Centre. A Singaporean Jiu Jitsu exponent during the Asian Games at the Jakarta Convention Centre. A Singaporean Jiu Jitsu exponent and her United Arab Emirates opponent during the Asian Games at the Jakarta Convention Centre. A Team Singapore player spikes the ball past two Cambodian players during a match at the OCBC Arena. A Korean player serves during the Women's Volleyball match against Vietnam of the Asian Games at the Gelora Bung Karno Sports Complex. Vietnamese and Korean players shake hands before the Women's Volleball match of the Asian Games at the Gelora Bung Karno Sports Complex. A Filipino player kisses the ball before a service during a match at the OCBC Arena. A player tips the ball over the net during the Beach Volleyball National Series at the Singapore Sports Hub. A Hong Kong player blocks a shot during the Beach Volleyball National Series at the Yio Chu Kang Swimming Complex. A Singapore player dives for the ball during the Singapore National Games at the Yio Chu Kang Swimming Complex. A Hong Kong player prepares to block a spike during the Beach Volleyball National Series at the Yio Chu Kang Swimming Complex. A Hong Kong player prepares to serve during the Beach Volleyball National Series at the Yio Chu Kang Swimming Complex. An inline skater spins at the East Coast Skate Park. An inline skater executes a grab over the edge of the quarterpipe at the East Coast Skate Park. A skater grinds down a handrail while smoking at Hougang Central. A player passes a frisbee past an opponent during a friendly at Ang Mo Kio Central. A player jumps to receive the frisbee during a friendly at Ang Mo Kio Central. A lion sits on an archer's bow during the archery competition of the ASEAN University Games at the National Institute of Education. An arrow leaves the bow or an archer during the archery competition of the ASEAN University Games at the National Institute of Education. 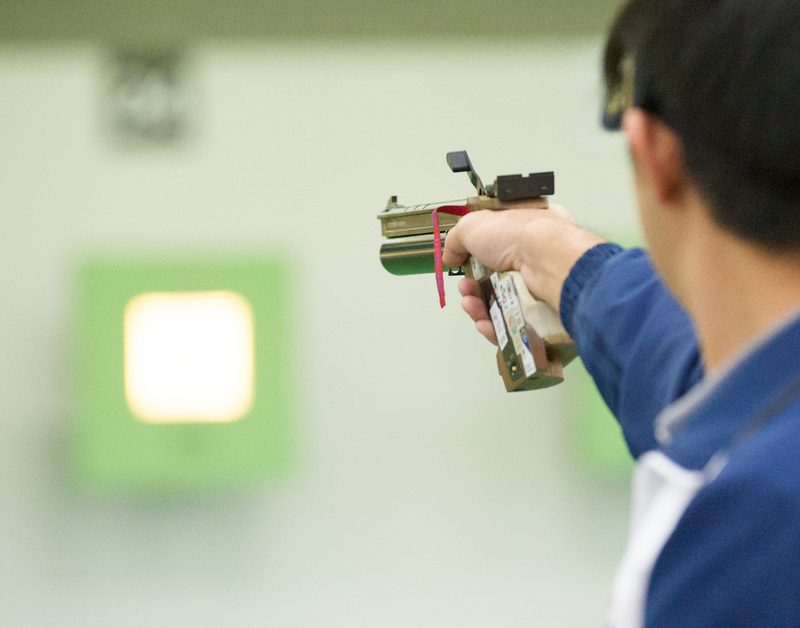 A Filipino shooter reloads during the shooting competition of the ASEAN University Games at Yishun SAFRA. A Thai shooter takes aim during the shooting competition of the ASEAN University Games at Yishun SAFRA. A Thai shooter recomposes himself during the shooting competition of the ASEAN University Games at Yishun SAFRA. A Thai official puts on the captain armband for a player during the sepak takraw competition of the ASEAN University Games at the Bedok Sports Hall. A Laotian player prepares to spike during the sepak takraw competition of the ASEAN University Games at the Bedok Sports Hall. A Thai and Myanmar player in action during the sepak takraw competition of the ASEAN University Games at the Bedok Sports Hall. A Malaysian player prepares to kick the ball during the sepak takraw competition of the ASEAN University Games at the Bedok Sports Hall. A Hong Kong player prepares to score during an international hand ball match at Our Tampines Hub. Uzbek players grab a North Korean player's arm during an International hand ball match at Our Tampines Hub. A Japanese player grabs an Uzbek player's arm during an International hand ball match at Our Tampines Hub. Singapore players block a Hong Kong player during an International hand ball match at the Sengkang Sports Complex. An Uzbek player passes the ball to a team mate during an International hand ball match at the Sengkang Sports Complex. A Singaporean cricket player bowls during the SEA Games at the Kinrara Oval. A Singaporean cricket players bats during the SEA Games at the Kinrara Oval. A Singaporean Lawn Bowler in action during the SEA Games at the National Lawn Bowls Centre. Petanque balls collide during the ASEAN University Games at the Toa Payoh Sports Complex.